About - RV Rentals Dallas - Southwest RV Rentals - Luxury RV Rentals in Dallas - Ft. Worth with Unlimited Mileage! Southwest RV Rental is your Premiere RV Rental Company in Dallas, Fort Worth, Lewisville, Plano, Frisco, Hickory Creek, Southlake, and the surrounding DFW Metroplex! We are a family owned and operated North Texas RV Rental Company located in Hickory Creek, Texas, and renting RV's to our Clients all over the US. We want your Rental Experience to be a joy, from start to finish. We will work hard to earn your Business while also giving you the Best RV Rental Price and Product in North Texas. We offer a Full Fleet of RV Trailers, Class C Motorhomes, Class A Motorhomes and Luxury Diesel Pushers for Rent. All of our Fleet is meticulously maintained so that you know when you rent from us you will have a quality, dependable, clean RV to enjoy your Trip. We also make sure that you don't leave our Lot without full instructions on setup, tear-down, and all the details of the amenities on each RV or Trailer. We want your Dallas RV Rental to be relaxing and enjoyable, so that you create all the best memories on your Trip. What sets our RV Rental pricing apart from other Dallas and Fort Worth RV Rental Companies? We offer Unlimited Mileage and No Generator Fees. When you drive down the Open Road you can relax knowing that you won't be charged for that extra excursion you didn't plan on or that long trip to see your Family. At night when you need to run the Generator you don't have to stress about extra fees which can add up quickly from other North Texas RV Rental Companies. We try to take the stress out of your Motorhome Rental so that you can enjoy your Trip. Our North Texas Luxury RV's and Motorhomes provide you with the Luxuries of your Home while sitting in the Wilderness of Yellowstone National Park! Whether you are tailgating at a Dallas Cowboys Game, parking at the Texas Motor Speedway, travelling to Disney World, planning your Corporate Outing or adventuring through one of the amazing National Parks in the US, you will have everything you need inside of one of our Trailers or Coach RV's. Our Motorhomes range in size from 28ft to 45ft in length, and are available with all kinds of luxury amenities like In-Motion Satellite TV, Outdoor Entertainment Centers, Sleeping for up to 8, and more. 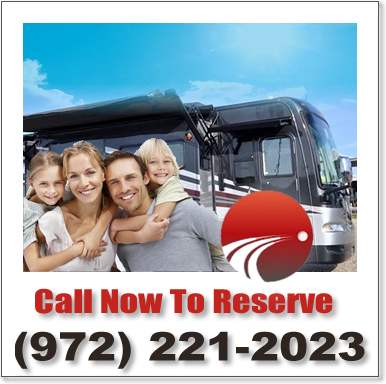 Southwest RV Rental is your go to RV Rental Company in Dallas, Fort Worth and North Texas. We also receive calls from all over the US for RV Rentals, and our RV's have traveled across Dallas and across the US. When you want to take your Family on a special Vacation, we are here to help. Call us today to find out how our RV Rentals are priced right, clean and dependable.